When AnnaMaria Cardinalli’s “explosive” United States military report on the topic of sexuality in southern Afghanistan was leaked to mainstream American media, it generated a firestorm of attention and reaction. While some of the findings regarding Afghan sexual practices are simply of cultural interest, other findings raise grave humanitarian issues, such as the cyclical abuse of young boys, perpetuated over countless generations. 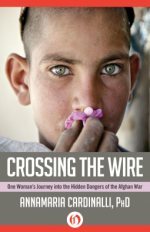 In Crossing the Wire- One Woman’s Journey into the Hidden Dangers of the Afghan War, Cardinalli returns to her diaries from the Human Terrain Team (HTT) mission to the Pashtun-inhabited southern region of Afghanistan. After classification reviews by both US and UK Government authorities, a day by day narrative remains of a female hired soldier operating in a sometimes boring, sometimes exciting environment. From western women’s “problems” in a army camp, staying apart from your fiancée who happens to be a US soldier as well to the meetings with local people. A large part looks back to AnnaMaria’s youth, her love for music, only to resume the diary part later. Eventually her field research on the role of sexuality and humor among the Afghan people. You learn what Bepto-Bismol or a micro credit could mean to women’s development. And the way men treat women and fellow men sexually isn’t simply cultural sexism, though forbidden by Islam, practiced widely in habitats where men and women live separately. But, what’s the difference with male US soldiers? Who’s willing to cross the wire and act on it? AnnaMaria Cardinalli received her PhD in theology at the University of Notre Dame. A classical and flamenco guitarist and operatic singer, she became an international recording artist while still a teenager. After September 11, 2001, she responded to a call from the Federal Bureau of Investigation for individuals with advanced degrees and cultural and religious expertise, which led to her service in Iraq under the auspices of Joint Special Operations Command. In 2009 she became a member of the United States Army’s first Human Terrain Team in Afghanistan, a unit designed to seek cultural understanding and civilian cooperation with US forces. Today AnnaMaria Cardinalli runs a private security firm in Santa Fe, New Mexico, while continuing to enjoy opportunities to pursue her first love: music. I received a review copy of this book by the publisher Open Road Media through Netgalley.